I covet a lot of recipes I find on some of my favorite food blogs. Some of them I think I can make better, different, healthier etc. Some of them I know I shouldn't mess with, because they are perfect as is. 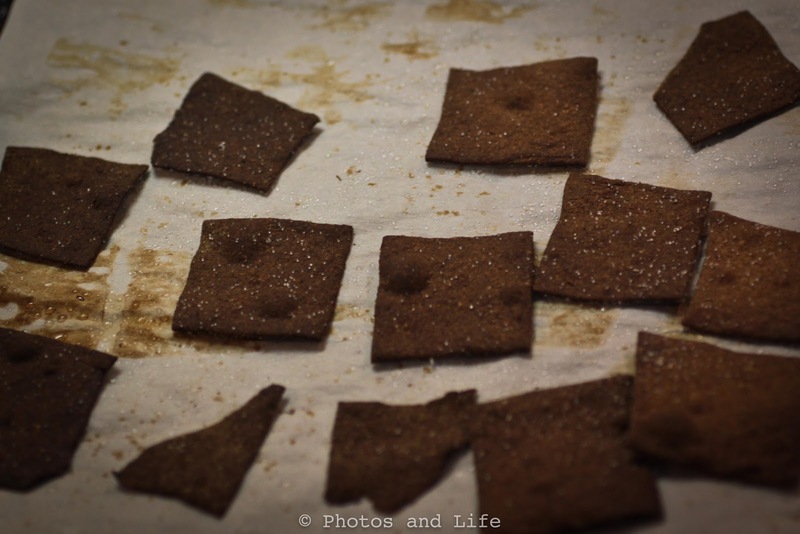 The Wheat Thins recipe on the Smitten Kitchen was pretty much perfection from the beginning. They are simple, healthy and delicious. This weekend for thanksgiving I was in charge of the salad and a few appetizers (thank goodness, because I don't love cooking meat with bones). I decided that these wheat thins would be the perfect accompaniment to a cheese plate, so I set out to make my first batch. After a successful first attempt I knew I had to make another batch (I didn't want to come with too few to enjoy)! Upon opening my fridge to pull out more butter, I smelled the delicious aroma of fresh dill. 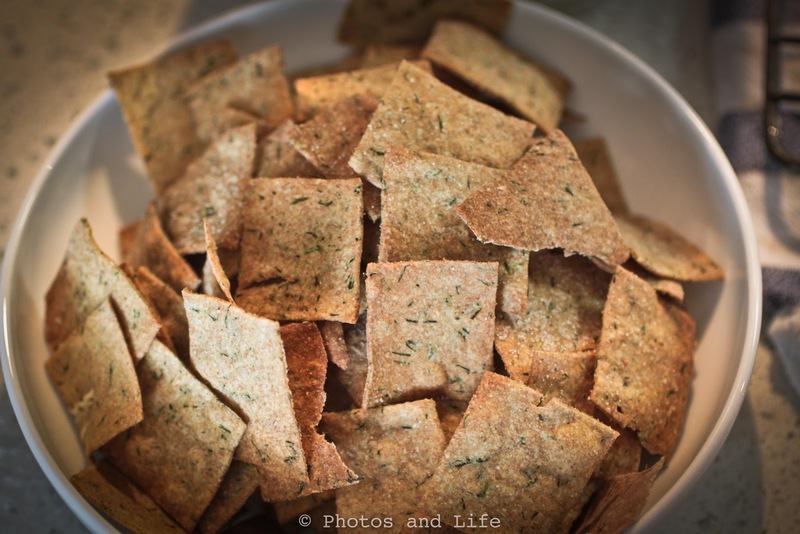 I had a revelation ..what if I could make herbed wheat thins! This revelation turned out to be a good instinct as these are SCRUMPTIOUS. Not only do these look gorgeous with the little specs of fresh dill, but they taste of cracked wheat, dill a light spritz of olive oil and salt. You can really choose a variety of fresh herbs (can you say rosemary will be my next project) or your favorite dried versions. I think making a bunch of different flavors and mixing them in a bowl would be a great treat for your guests. Yield: Aprox 3 to 4 dozen (depending on how thin you roll them out...I like mine thin). Take 1/2 of your dough and roll it out on the counter with a rolling pin until its thin. Using a straight edge (I used a thin cutting board) and a pizza cutter, slice your dough into 1 to 1.5 inch squares. 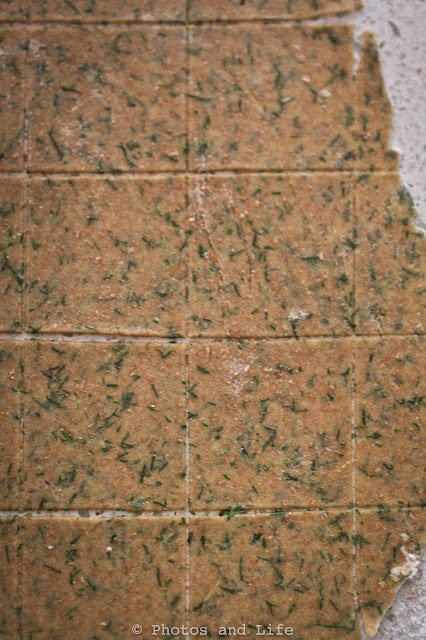 Coat squares with a light dusting of olive oil (I use a misto - if you don't have one I would suggest running out to buy it) and salt. If you are playing with your dog instead of watching the oven, this can happen!